I was wondering what to do for lunch last Saturday. Our cook Banu comes late to work on weekends and there was no lunch at home. I was feeling too lazy to cook. Didn't want to order in either. I suddenly remembered that there was a pack of ready to eat paneer curry at home. One of those heat and eat types. I thought that I would have that for lunch. Most of us Indians, or me at least, have the need to have a carb or cereal along with our meals. So, the next question was what to eat the paneer with. The obvious pairing which came to my mind was to have the paneer curry with roti. The problem was that I don't make rotis myself. It is not easy to order in just one or two rotis where I stay in Mumbai though a store called Roman Stores nearby does stock ready made unbranded chapattis. The other option was to buy sliced bread or pav. Somehow, bread and paneer curry didn't seem a good option to me. Which is when I got the idea of making rice and well, I am a cat at making rice. I buy a type of basmati rice called Biryani King from Vijay Stores at Bandra's Pali Market which is sold loose. I make it the way I saw my mother cook rice when I was in a kid. I soak the rice, drain the water then boil the rice in a lot of water and then drain out the water. The resultant rice that I get is poetic with each grain being separate. I don't add any oil, salt or cooking soda while cooking the rice. Hold on, rice with paneer? Rice and paneer curry didn't seem entirely right to me though. I have had paneer curry with pulao occasionally in the past, but rarely with plain steamed rice. I wasn't sure if it would work. Finally convenience drove my choice and I decided to make the rice and then heated the paneer to have it with it. How do we decide on what is 'the right way'? Which got me thinking, why was I so fixated on what the paneer curry should be eaten with? And where did these notions of the 'right pairing' that I held come from? I realised that paneer is not something that I eat often or relish much to be honest and it is not really close to my heart. So I decided to look at fish curries instead for the analysis. I obviously had time to kill! I remembered my first visit to a Gomantak (Hindu Goan) seafood restaurant in Mumbai way back in the late 1990s. I was new to Mumbai then. I went to this place called Saayba in Bandra (west) with two other Bengalis. All of us were missing fish in our new home. The first difference in the food on offer at Saauba was that the fish used was saltwater fish from the sea while we Bengalis dote on freshwater river fish. Plus most of the curries in the restaurant were coconut based and we hardly use coconut in our curries in Calcutta. We were willing to live with these difference as we knew that we were in the coastal city of Mumbai and not back at Kolkata which is built by the river. We respected the need to 'eat local' before the term became trendy. Ore shabash, fish with roti???!!! Then I noticed something strange at Saayba. I spotted people eating fish with rotis and that flummoxed me. I'd always eaten fish with rice growing up in Kolkata. Never roti! This was a new pairing for me and for the rest at our table too. The three of us Bengalis stuck to our guns and had our curries at Saybaa with rice that evening. It's been twenty years since then and I've eaten in many coastal Malvani, Gomantak and even Mangalorean seafood restaurants in Mumbai and have had Parsi seafood dishes here too. I've learnt to eat and enjoy the local fish curries not only with rice, but also with wheat rotis (Maharashtrian) and rotlis (Parsi), bhakris (made with rice flour by Maharashtrians) and, in Mangalorean joints, with appam and neer dosa. I have learnt to adopt to the ways of my adopted city. I'll never have Bengali fish curries with anything but rice though. My wife, a Parsi who took to Bengali food famously after meeting me, would sometimes fox the folks at Oh Calcutta, Tardeo, by having her ilish with luchi which is unthinkable to us Bengalis. The waiters would politely try to tell her to do otherwise. I'd have to step in and explain that she knows the drill but prefers this and, when she was not looking, roll my eyes at them! To be fair, she doesn't eat rice in general. Does logic play a role or is it about shared cultural memories when it comes food pairings? Machher jhol and bhaat (fish curry and rice) is the not the only combination in the Bengali kitchen that I hold sacred. There are other food pairings that matter to me too. For example, kosha mangsho (slow cooked goat meat) should be had with pulao or luchi while mangshor jhol (a thin curry) with plain rice in my head. Alu posto, on the other hand is fine to be had with rice and roti but not luchi. Alur dom is better with luchi or even slices bread but not rice. I think the rule of thumb for me is that dry dishes, or dishes with thick gravies, go better with Indian breads (roti, luchi) or pulaos than with plain rice while thinner curries go with steamed rice. There are exceptions of course. Take the chorchori, or the dryish Bengali vegetable dishes, for example which can go well with rice too. That's possibly because the vegetables are cooked till a bit soft and often have a spiced paste such as mustard or posto baata enrobing them which help these combine well with rice. If a its a simple fry or bhaaja on the other hand, the I like to have a daal to go along with my rice and veggies. This pairing obsession is not limited to us Bengalis and favourite food pairings exist across India. Which made me wonder, what leads to these pairings becoming popular. Is it childhood memories which shapes our beliefs on the 'right way' of eating? Or is it experience? As a child I grew up in my grand-mom's and then in my mom's kitchen, both of whom lived in Delhi before they came to Kolkata. I am sure that influenced their world views on food too. We would not have paneer often back then but would occasionally have the Bengali equivalent, chhanar borar dalna, often. We would have this usually with roti and not rice. When my mother would by paneer from the stores to make curries at home, it would be served with ruti (roti) again. Perhaps that's why I always think of having paneer curries with roti and not rice. I do feel, however, that there is a logic to why these pairings exist so let's not run them down as just being emotion based. Let's take the paneer curry and rice that I had on Saturday for example. Did it taste good? The dahi based 'shahi paneer' curry lacked enough salt or bite to make it pair well with rice. Steamed rice doesn't have much flavour of its own and needs a side dish with character to make it sing after all. And, unlike in a prawn, fish or meat curry, the paneer didn't add any flavour to the curry that I had. Plus, being a packaged dish, the paneer was a bit rubbery and didn't really give much pleasure in any case. A pulao, which has flavours of its own, would have gone better with the paneer curry if not a roti or paratha. To cut a long story short, I don't think I am going to have paneer curry with rice in the near future . PS This post is not inspired by the recent developments in the politics of Tamil Nadu and the headline is not an attempt to take advantage of it. would rather have a paneer curry with roti/ paratha. Only 7 pc would have it with plain rice. 2. A post on sheem patoori by Nandita Iyer of Saffron Trail. I saw this while writing my own post. At the end of her post, Nandita writes about how she felt that the mustard based dish combined well with rice. Traditionally, Bengalis combine patoori with rice. 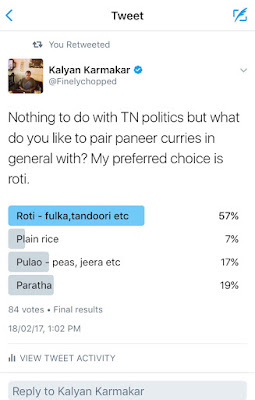 Nandita might not have had this cultural context but still arrived at the ideal pairing using food common sense and logic. This is an example of the point I made about how food pairing rules are based on experience and not just blind belief. This is not to say of course that commonly held views of food pairing can't be challenged. Whatever works!